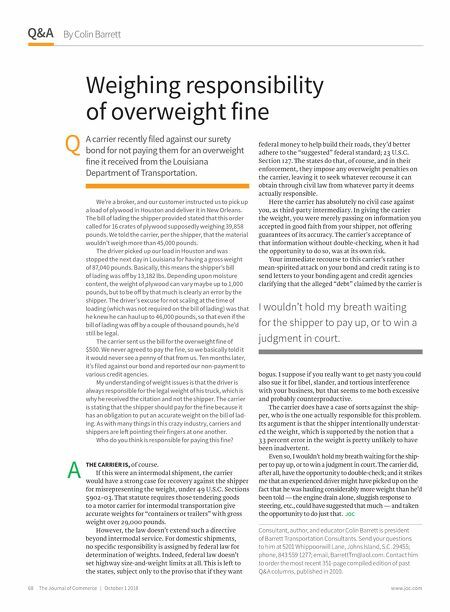 68 The Journal of Commerce | October 1 2018 www.joc.com By Colin Barrett Q&A A Q Weighing responsibility of overweight fine A carrier recently filed against our surety bond for not paying them for an overweight fine it received from the Louisiana Department of Transportation. We're a broker, and our customer instructed us to pick up a load of plywood in Houston and deliver it in New Orleans. The bill of lading the shipper provided stated that this order called for 16 crates of plywood supposedly weighing 39,858 pounds. We told the carrier, per the shipper, that the material wouldn't weigh more than 45,000 pounds. The driver picked up our load in Houston and was stopped the next day in Louisiana for having a gross weight of 87,040 pounds. Basically, this means the shipper's bill of lading was off by 13,182 lbs. Depending upon moisture content, the weight of plywood can vary maybe up to 1,000 pounds, but to be off by that much is clearly an error by the shipper. The driver's excuse for not scaling at the time of loading (which was not required on the bill of lading) was that he knew he can haul up to 46,000 pounds, so that even if the bill of lading was off by a couple of thousand pounds, he'd still be legal. The carrier sent us the bill for the overweight fine of $500. We never agreed to pay the fine, so we basically told it it would never see a penny of that from us. Ten months later, it's filed against our bond and reported our non-payment to various credit agencies. My understanding of weight issues is that the driver is always responsible for the legal weight of his truck, which is why he received the citation and not the shipper. The carrier is stating that the shipper should pay for the fine because it has an obligation to put an accurate weight on the bill of lad- ing. As with many things in this crazy industry, carriers and shippers are le pointing their fingers at one another. Who do you think is responsible for paying this fine? THE CARRIER IS, of course. If this were an intermodal shipment, the carrier would have a strong case for recovery against the shipper for misrepresenting the weight, under 49 U.S.C. Sections 5902–03. That statute requires those tendering goods to a motor carrier for intermodal transportation give accurate weights for "containers or trailers" with gross weight over 29,000 pounds. However, the law doesn't extend such a directive beyond intermodal service. For domestic shipments, no specific responsibility is assigned by federal law for determination of weights. Indeed, federal law doesn't set highway size-and-weight limits at all. This is left to the states, subject only to the proviso that if they want federal money to help build their roads, they'd better adhere to the "suggested" federal standard; 23 U.S.C. Section 127. The states do that, of course, and in their enforcement, they impose any overweight penalties on the carrier, leaving it to seek whatever recourse it can obtain through civil law from whatever party it deems actually responsible. Here the carrier has absolutely no civil case against you, as third-party intermediary. In giving the carrier the weight, you were merely passing on information you accepted in good faith from your shipper, not offering guarantees of its accuracy. The carrier's acceptance of that information without double-checking, when it had the opportunity to do so, was at its own risk. Your immediate recourse to this carrier's rather mean-spirited attack on your bond and credit rating is to send letters to your bonding agent and credit agencies clarifying that the alleged "debt" claimed by the carrier is bogus. I suppose if you really want to get nasty you could also sue it for libel, slander, and tortious interference with your business, but that seems to me both excessive and probably counterproductive. The carrier does have a case of sorts against the ship- per, who is the one actually responsible for this problem. Its argument is that the shipper intentionally understat- ed the weight, which is supported by the notion that a 33 percent error in the weight is pretty unlikely to have been inadvertent. Even so, I wouldn't hold my breath waiting for the ship- per to pay up, or to win a judgment in court. The carrier did, after all, have the opportunity to double-check; and it strikes me that an experienced driver might have picked up on the fact that he was hauling considerably more weight than he'd been told — the engine drain alone, sluggish response to steering, etc., could have suggested that much — and taken the opportunity to do just that. 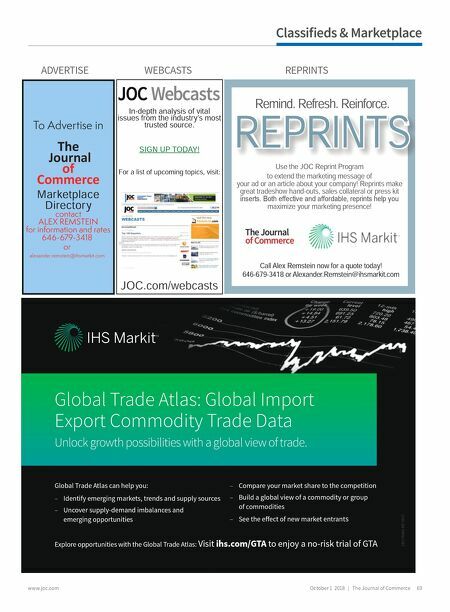 JOC Consultant, author, and educator Colin Barrett is president of Barrett Transportation Consultants. Send your questions to him at 5201 Whippoorwill Lane, Johns Island, S.C. 29455; phone, 843 559 1277; email, BarrettTrn@aol.com. Contact him to order the most recent 351-page compiled edition of past Q&A columns, published in 2010. I wouldn't hold my breath waiting for the shipper to pay up, or to win a judgment in court.